“There are different levels of accepting my child’s ability. That I can be happy with whatever he will be able to attain in his life as a PWA.” said by one of the participants of the Family Support Group. The 13 participants consisted of 8 mothers, 4 fathers and 1 grandmother, mostly from the province of Bulacan. The FSG held last November 19, 2011 is the last of the series for this year and was facilitated by ASP Trustee, Ms. Mariter Jalandoni-Macapagal and ASP Executive Director, Ranil Sorongon. ASP Malolos Chapter President Dr. Anawi Tolentino also came to attend the FSG. Ms. Macapagal shared their family’s journey with Andrei, a PWA who is now 45 y/o and loves to paint and watch TV. 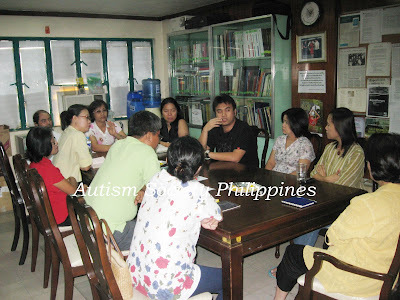 Their family’s journey was written in “Our Andrei: Living with Autism,” click here to read more. Each of the participants was asked to introduce themselves, give brief information about their child and shared some of their experiences. Ms. Macapagal, one of the co-chairs of ASP’s Advocacy Committee, said that TIME, LOVE, SUPPORT and ACCEPTANCE are the best gifts they can give to their children with autism. She also discussed the importance of Early Detection and Early Intervention Program. Early detection is the key for an early intervention, this is important in improvements in the child’s functioning. Early detection and early intervention (EDEIP) are fundamental in the development of CWA to become fruitful members of the society. Her personal family journey and practical advice gave much encouragement and hope to the participants. They realized that they are not alone, that they can learn a lot from other parents like them and requested to have a support group meeting for siblings. ASP continues to work harder to Share Hopes and Build Dreams for families of children dealing with autism. Be an Angel for Autism. Donate generously to ASP Programs and Services. Donate to Autism Society Philippines Metrobank Kamias Branch 047-3-04751874-2. Email us at autismphils@gmail.com or call 9266941 / 9298447.